TP-Link's Archer T6E supports the next generation WiFi standard - IEEE 802.11ac, offering transfer rates that are 3 times faster than wireless N speeds. 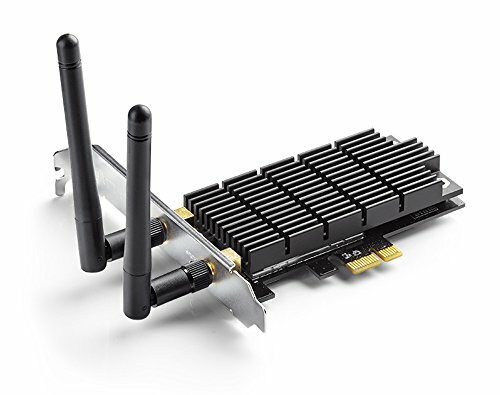 Easily upgrade your desktop system by simply slotting the Wi-Fi adapter into an available PCIE slot. The Archer T6E provides high-speed Wi-Fi of up to 867Mbps over 5GHz, perfect for HD video streaming and lag-free online gaming. Additionally, the 2.4GHz 400Mbps Wi-Fi band is ideal for standard network / internet usage such as web surfing. Heat Sink helps to dissipate heat generated by the adapter, which in turn increases performance and improves stability. Additionally, lower temperatures ensure an increased adapter lifespan.